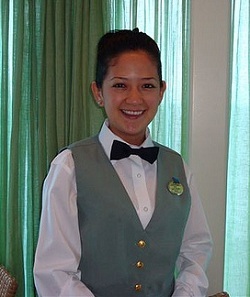 - During the day time this food and beverage venue works as a self-service buffet and the main duties of the Buffet Steward/ Stewardess are to clean tables, transporting back to the buffet galley soiled dishes, glassware and silverware and refilling coffee and complimentary non-alcoholic beverages. $1600-2000 U.S. per month depending on the cruise line, size of ship and gratuities from passengers. Possibilities for promotion to Junior Waiter / Waitress or Bar Server position.